Aether and Empire #1 to #4 Review | Warped Factor - Words in the Key of Geek. 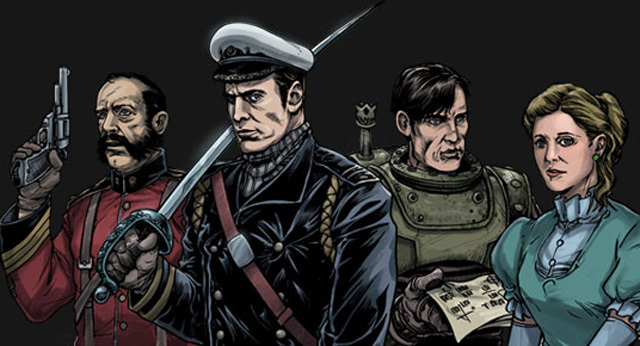 It's Jules Verne meets Star Trek in Aether and Empire. Gail Williams catches up with the first four issues. It’s 1879, and the world is a very different place to anything that sits in the history book on the shelf. Her Majesty’s Airship Nimbus flies through the air with the greatest of ease, looking out for the other ships all at sea. It turns out that when her first officer spots a Privateer, he’s not exactly averse to using their own tactics against them. Which is what gets him, now Captain Bristow, the commission of the Century. He's asked to lead a fact finding mission to establish if a previous scientific mission that is not reporting in has gone badly askew and if a substantive threat to the Empire exists. 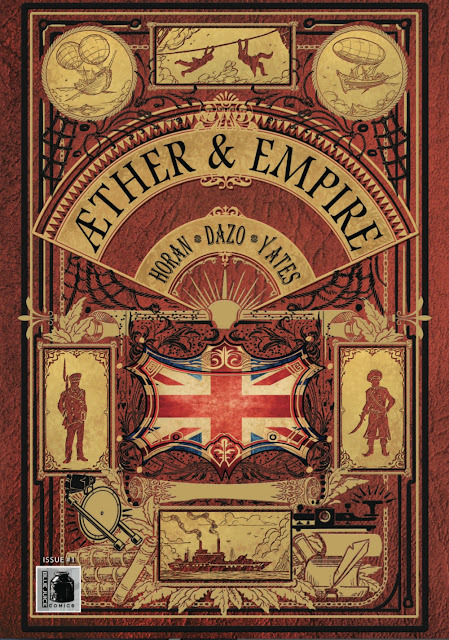 And so begins the Victorian science-fiction steampunk adventure comic, Aether and Empire. First we are introduced to the crew; Lieutenant Griffin from the Nimbus, who looks about 14 but is clearly older. There’s Major Bronson Quigley, of the King’s Own 4th Regiment of Foot, who comes with all the usual facial hair attendant to such positions. Next is Barnaby Dunwood, the scientist who is supposed to be in charge of the mission and isn’t exactly happy about being put under another's command. There’s Professor Watson (no relative to Sherlock, I'm sure), Mr Fergus and Miss Gangadharan who “build the ship’s Heliograph [think telegraph], and knows it better than any man alive!” And last there’s the Doctor Forneau. He’s wearing dark glasses and has a reputation for “experimental procedures.” There are of course others, but you get to see more as the comic progresses. And where are they off? Why to Her Majesty’s Space Ship Jules Verne, on its mission to Mars. As the ship blasts its way on solar powered engines, Captain Bristow and the reader are taken on a tour of the facilities - and mighty fine they are too, even the magnetic torpedoes and the oxygen replacement system (better known as a greenhouse). The Bridge is a fine sight to behold, it even has a Dunwood Logic Engine (which looks like a Babbage Difference Engine to me). Of course after the ship is underway there’s a stowaway found on board. One Lillian Pettigrew, wife to Douglas Pettigrew, one of the men lost on the previous mission, and who has a connection to Dunwood that is clearly closer than it perhaps ought to be. They collide with another craft, this one of obvious extra-terrestrial origin and apparently derelict. An away party is sent across, there’s been a hull breach. However, they do find two bodies, one human, one… something else. They bring the human back on board, he’s Thomas Pennybaker, one of the crew from the missing expedition, who is passed on to Dr Forneau for autopsy. The doctor wants the body to tell him more, and experiments to get the story, dragging Lillian in to help as he goes. While the doctor is working, others are on the ship, patching up the hull breach, then they realise what kind of ship it is. An Aether ship, Aether in this case being “a single, all-pervasive substance that allows light, heat, magnetism, even gravity to travel through space.” It is some impressive scientific discovery that will change everything. There again Thomas is about to change a few things too, risen like Frankenstein’s monster he rips through the crew (literally), whilst proclaiming that he won’t be made a monster like the rest of them, he won’t be made a slave. So he pulls his own mechanical heart out. Well Bristow was looking for substantive proof of life and threat, and guess what - he found it. So what’s he going to do next? I have to admit, I enjoyed issue one, but I wasn’t overly keen. I couldn’t see where it was going to go and in all honesty wasn’t sure I was going to bother with later issues. But then I got bogged down and in life and before I know it, I had four issues waiting to be read, which I have now finally got through reading. After issue two and the introduction of the HMSS Jules Verne, the story and my reading of it sped up somewhat - went into hyperdrive you might say. The Nimbus on page one is a ship Gaiman would be proud of, in fact it looks like the kind of place Captain Shakespeare would be happy in (in case you don’t get it - those are Stardust references - great book/movie go read/watch it). The named characters initially appear to be a bit Kirk, Spock, Uhura and a twisted saw Bones, thankfully that impression passes quickly and the story moves us on. Yes I can see other influences here (Event Horizon and Alien being just two), but that’s perfectly acceptable and indeed enjoyable. It’s kind of reassuring to know that these are cultural references I’m not the only one who gets. Mike Horan’s writing is good and for the most part Bong Dazo’s artwork is too, but there are far too many panes when the picture quality falters, perhaps not hugely, but it falters. There’s Griffin looking about 14, but acting more like 24. Lillian is well out of proportion in several places and for once this isn’t down to Victorian corsetry. Dazo's ship design is great, the panels where Thomas is reanimated - all good, but every now and then I found myself thinking that he rushed the boring bits to get to the good stuff (we’ve all done it). 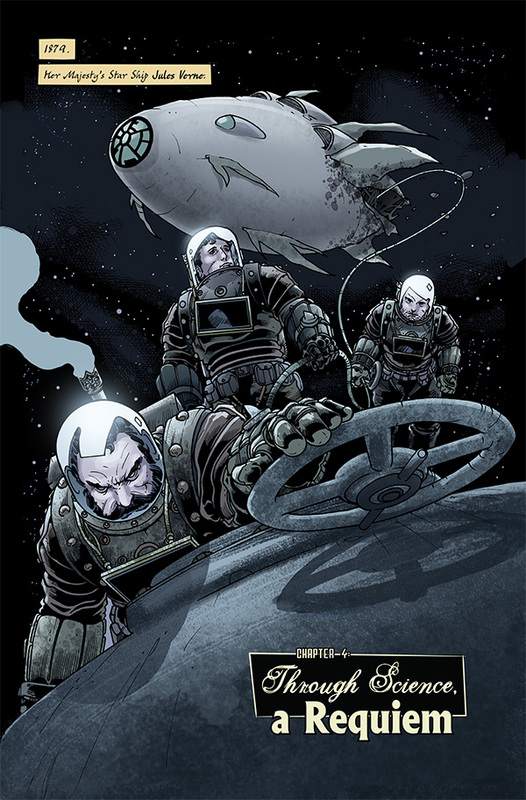 As for Tim Yates, he’s the colourist and cover artist, and he does a cracking job. I particularly like that he makes the back covers reminiscent of the way hard backed books used to look. So despite the slow burn to start, I would recommend this title. 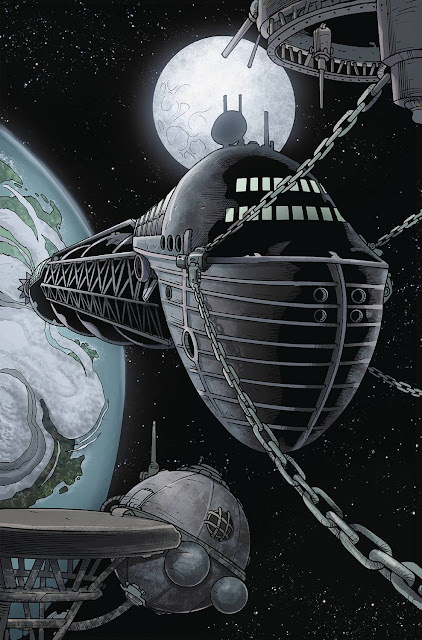 For the first four issues, I’d give Aether and Empire a very enjoyable three (nearly, but not quite a four) out of five.